I’ve been shamefully derelict in updating my blog lately. A lot has happened: I’ve moved back home to Kansas City for the time being, I formally completed my master’s degree and have the paperwork to prove it and I’m currently job-hunting. One thing I’ve been doing a lot to stay busy and productive (sadly, though, not “thin”) is cooking and baking. Like two years ago, I made all of the family’s Christmas goodies with my mother this season. 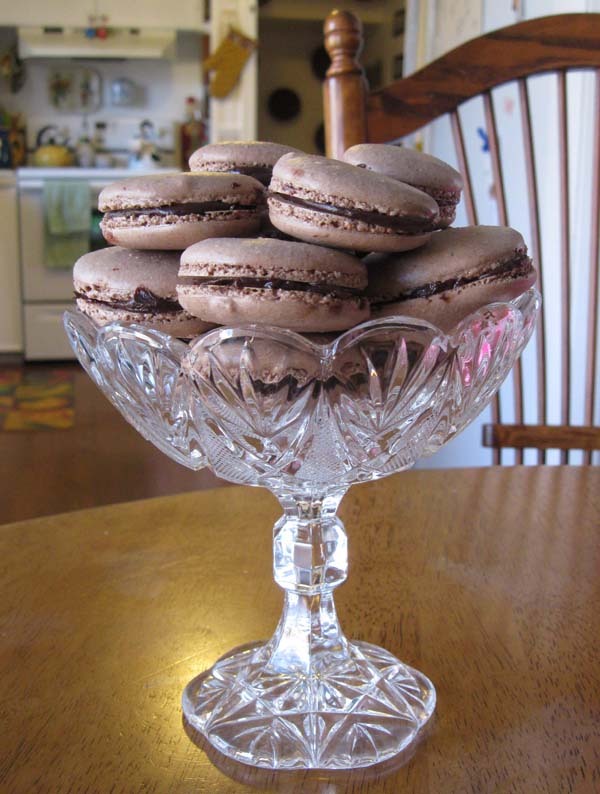 This year’s menu consisted of red velvet cupcakes (the Hummingbird’s recipe from “Cake Days”), vanilla-and-spice whoopie pies (also from “Cake Days”), chocolate-and-caramel shortbread bars and peppermint macarons. For Christmas Eve, I put together a Linzertorte, a German pastry made with almond meal, lots of butter and raspberry jam. I have a few cooking feats I want to achieve in the next few months. Sometime later this winter, I’m playing host to an Indian dinner party for my family, serving homemade chicken tikka masala, naan, bombay potatoes, pilau rice and pistachio rice pudding. The chutney and papadams, I’ll probably buy. I also want to improve my macaron technique (I’ve made better cookies than most food bloggers’ efforts that I’ve seen, but I’m no Ladurée), field a decent risotto and make a Battenburg cake, the gold standard British teatime treat. Despite this baking, I’m still not a food blogger (if you want to read a great one, read my friend Brenna’s). But I love doing it for fun, it gives me something to do and I enjoy it. More importantly, I also hope to start regularly updating my blog again, now that I’m in a more stable living situation. The Republican primaries are coming up, there’s a lot of social media topics to be discussed and lord knows I need to keep up with my writing. In the meantime, I can make more of these. Not bad for a first effort, no? They have feet!! Despite a generous cost-of-living stipend in my student loan, I’m going to have to be smart and frugal about my food budget. I’m also going to try hard to eat fresh, healthy food, cut back on soda (which is more expensive there anyway, so I have a good incentive) and eat out rarely (although I may splurge on quiz-night chips). Luckily Canterbury has a Sainsbury and a Tesco, and the university has an on-campus grocery store. My dorm also has a full kitchen. I find it easier to eat well when I’m on my own and not in a time rush. So what am I planning to do? The main things I cut out in Indianapolis, my first major foray into regularly and knowingly not eating crap, were red meat, soda and packaged sweets. I didn’t fudge on the soda until the Olympics started and I needed a caffeine fix one night on the Star’s sports desk. As a side note, I lost a ton of weight (which I promptly gained back as soon as I got back to Lawrence; thanks, Chick-Fil-A and Pizza Hut). I know vegetarianism isn’t realistic for me, namely because I A) like meat and B) am fairly picky about vegetables. I prefer raw spinach and baby greens, loathe onions, am allergic to mushrooms in general and like my tomatoes sun-dried. Luckily spinach is one of the best things you can eat. As far as meat and protein go, my Indianpolis diet consisted mainly of chicken, salmon, eggs, nuts and turkey. I love salmon, something my parents don’t care for. It’ll be nice to justify getting salmon steaks or smoked salmon just for myself. The only fruits I’m not big on are citrus fruits and peaches, although I love their juices. Blueberries, raspberries, apples, strawberries, kiwis, pomegranates, mangoes, pears; they’re all good. I’d love to make my own bread (I bought a loaf of whole-wheat bread at Kansas City’s City Market last week that was to die for), but that probably isn’t realistic. I’m going to try to stick to whole wheat or rye bread. Regarding dairy, I like milk and many varieties of cheese and yogurt, although I do worry about the fat and salt in some of it. I enjoy brown rice, basmati rice and black beans. Our backyard herb garden has yielded amazing basil, rosemary, parsley and thyme; cilantro is the only herb we don’t grow that I wish we did (our sprouts got rained out, sadly). My experimentation with Greek and Indian food has exposed me to a variety of different grains, proteins and spices, like bulgur wheat, hummus, tumeric, saffron and basic curry powder. I look forward to trying almond butter and fruit on toast, cilantro and lemon rice with black beans and fish, homemade trail mix and oatmeal with fruit and honey. For beverages, I’m going to try to stick to low-fat milk, water, 100% fruit juice and tea, although I know coffee will probably be a continued vice. I also tend to believe that healthy food isn’t more expensive than unhealth food and that access, not price, is the problem. That’s why I’m glad I have access to a variety of different grocers at school. Rather than get presents for family members, my mother and I decided to make everyone goody boxes filled with sweet treats. Because my mom’s family is mostly German, I picked out a few German specialties for the boxes. We baked the first items, Lebkuchen, a week ago, because the cookies need to “set” for a couple of weeks. The word Lebkuchen means “cake of life” auf Deutsch. They’re basically Christmas sugar cookies from Nuremburg. They take ground almonds, cloves, cinnamon and cardamom, and are made with an icing of rum, sugar and egg whites. I thought the icing had a weak rum taste when it was fresh, but a glance at the cookies last night showed me just how much the alcohol has set in — woo. Yesterday was basic Pillsbury sugar cookie-decorating day, an excuse for my cousins, my aunts, my mother, my grandmother and I to go nuts with icing and sprinkles. We opened up English Christmas poppers and wore the tissue-paper hats all day. Thumbs up. As I type this, a plate of fresh fudge is sitting in the kitchen. Tomorrow we’re making Berlin Kranzer, which roughly translates to “Berlin wreaths.” They’re little shortbread-like cookies twisted into wreath shapes and garnished with red and green peppermint candies. Tuesday is amaretto brownie day. I didn’t feel like springing for the actual liquer, seeing as I don’t generally care for the stuff, so we’re just using almond extract instead in the brownies and frosting. I’m excited for Wednesday, even though the cake that day is going to be a challenge. I’m making Aegean cheesecake, using Greek thyme honey and riccotta in place of the more expensive mizithra cheese. We’re also doing the crust from scratch, which could be tricky. Thursday, right before we finally pack up the boxes (we’re also including baggies of chocolate-covered almonds that my dad makes at work), we’re making my piece de resistance: Black Forest cake. It’s chocolate cake with Kirsch (German cherry brandy) mixed in, between layers of whipped cream and stoned black cherries. I’m going to shave Lindt truffles on top of it and garnish each slice with a fresh cherry. Mmm. Full disclosure: I’m drinking a Pepsi right now. I have maybe half a case of it out in the garage. Once that’s gone, I’m laying off for a while. I’ll tell my mother not to get it for me, and I’ll make sure she keeps it from me even when I go half-mad with withdrawal. It’ll be like Odysseus’ crew tying him to his ship’s mast, only my Siren is a sugary carbonated beverage. I’ve always loved soda (or pop, whatever) a little too much. Right before finals during the second semester of junior year at KU (May ’08), I did something radical. I gave up soda. I drank tea, milk, juice and Vitamin Water (which, to be fair, is almost as sugary as cola). And coffee. Oh, coffee. I had the massive headache you’d expect from quitting caffeine cold turkey, but it eventually passed. My break from cola coincided with a move toward healthier foods during the summer I spent on my own in Indianapolis. I gave up beef and pork, completely, for the summer. I ate mostly chicken, turkey and fish. I had whole-grain waffles and bread, eggs, organic potato products, Kashi cookies and granola bars, low-fat yogurt, fruit, spinach and PBJ sandwiches. Looking back, my usual “lunch” at work was vegetarian: water, fruit, yogurt, cheese and either a spinach salad or a PBJ. I lost a lot of weight. Sure, I gained it back as soon as I got back to KU, but that’s beside the point. Note that I cut out soda. I did not, not at all, cut out caffeine. My caffeine came courtesy of daily (on work days) venti skim-milk mochas from Starbucks, over ice and with no whipped cream. If you knew how much fat was in that whipped cream, you wouldn’t get it either. You know you’re hooked when you take that first sip of cold coffee on a hot day and feel an actual physiological reaction. So how long did my break from cola last? It lasted until the 2008 Beijing Olympics. One night, working on the sports desk and stressing out from a larger workload and impending deadline, I cracked and drank a Pepsi. And another. Needless to say, my life in the newsroom that school year necessitated caffeine, and while I limited soda last summer in Columbus, I never tried to cut it out totally. Lately, I’ve started to think more about what I eat. I don’t think I could ever go vegetarian — I’m allergic to mushrooms and picky about a lot of other vegetables. I also like eating meat too much. But I’m trying to make an effort to cut out junk food and soda, and possibly cut down on red meat. I traded store-bought cookies for rice cakes, and I’ve made my own pastries and breads. I’ve researched more healthy recipes and organic food. I’ve actually been watching History Channel’s Modern Marvels specials about snack food and sweets production. While it’s interesting to see how things are made, it almost makes me feel ill thinking about how overly processed and chemically altered most “food” is these days. My shift will be a slow one. I’m starting small by phasing out the Pepsi. Then, we’ll see. Stay tuned. One of my missions during my year off from school is to become a better cook. That’s not to say that I was ever a BAD cook, just an inexperienced one. I’ve already done well with baking. I made a loaf of pumpkin bread and a loaf of banana bread, chocolate cookies and raspberry crumble bars, which my parents promptly consumed. I’m making another loaf of banana bread tomorrow, and I’m giving holiday bread to my family for Christmas. My other cooking adventure this weekend is making an Irish meal Saturday. I’m baking brown soda bread early in the day, and preparing a beef and barley stew for dinner. Not only does this sound really tasty, but it also gives me the chance to kind of embrace my heritage. My dad’s family is English and Scots-Irish, and my mother’s family is mostly German. I also love curry (a love I picked up overseas in the capital of tikka masala, England), and have made chicken curry dishes before, but always with a pre-made sauce. One of my next challenges is to make a curry from scratch. I’m leaning toward a shrimp dish with coconut milk, ginger root and cardamom.